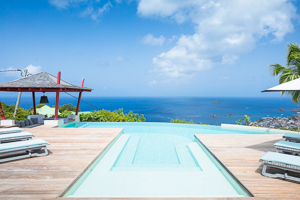 Villa UJV 294, also known as Blue Swan, offers sweeping sea views over Gustavia, St Barts. The convenient location of this spectacular villa offers quick access to gorgeous Gouverneur Beach as well as the famous restaurants and boutiques of Gustavia. Designed with a modern touch, this villa's central masterpiece is its infinity pool, perfect for entertaining, swimming or just lying around. The pool terrace offers both covered spaces and an enormous decking area for sunning. A unique feature of the outdoor entertaining area is a swim-up bar at the pool. The kitchen is fully-equipped with everything a chef could ask for, including a professional grade espresso maker and a meat slicer for Carpaccio enthusiasts. Dividing the kitchen from the covered dining terrace is a breakfast bar which seats 6. On the dining terrace there is a dining table which seats 12, and has a lovely view of the sea. The villa features satellite television and the bathrooms are spacious and stylish. Each of the serene and spacious bedrooms offer privacy and have garden or sea views. Beautiful views, fantastic kitchen, a poolside bar and sunsets, it's the perfect setting for a relaxing vacation.